This is such an incredible find!! 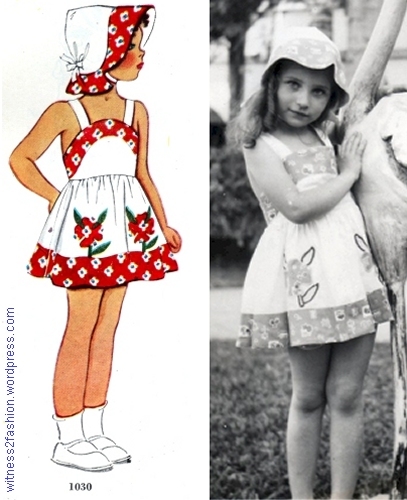 What a wonderful dress, and so amazing it came with the pattern and page from Delineator too! It’s so much fun imagining what Dot must have been like. Such a lovely piece of history! I’m so glad Liza shared it with you so all of us could see it too! How beautiful! I discovered Helen Twelvetrees just a few years ago and she’s wonderful! I don’t know why she didn’t become more well known to us later. A beautiful and fun-to-watch actress. P.S. Disgraced, starring Helen Twelvetrees, was a Paramount picture…. She seems to have often been treated very badly by scandal magazines — as when her alcoholic first husband made a suicide attempt. After leaving Hollywood, she returned to stage acting. Entirely up to Witness2Fashion, as this is her work, but I’m fine with it, if she is. Liza and I want people to see it! Please re-blog. Be sure you keep the links to Liza’s Better Dresses Vintage, since this dress and the pattern are for sale there. Thank you so very much. The post will get re-blogged on Tuesday morning. Again, I do appreciate your permission, and agree that it should be shared with the maximum number of fashion and sewing history enthusiasts — and potential customers for Liza. How wonderful to see the same design from different sources, as well as an extant garment! I would love to know more about Dot! The note on the envelope was intriguing enough, and then I noticed the edited note from Liza. This reminded me of a long-ago incident. I was friendly with the owner of a vintage clothing shop (before vintage became really popular, and also before widespread use of the internet). One day she had a beautiful 30’s wedding dress on display – it had a very distinctive look, with a yoke and collar of rouleaux joined with thread. I was just tickled to see it, because I remembered seeing a dress of the same design (from the vintage clothing collection of a particular designer) featured in a popular sewing magazine! Those “I’ve seen this before” moments are wonderful, especially when we can put a name to where we saw it. Here is one of mine: In the case of this McCall pattern, I didn’t remember wearing it, but I did remember seeing it in an old photo … I cringe, but there I am hugging a flamingo statue while wearing a pattern I saw in a vintage catalog 60+ years later! Click here for the blog post about it. You’re awfully cute in that little sunsuit! It’s so nice when you can make connections between things. when I click the link in your email to seweverythingblog I get a page that says saminamirza50.wordpress.com is no longer available. But when I do a google search, I find your homepage immediately. https://seweverythingblog.wordpress.com So — something with wordpress to straighten out. If only wordpress let you talk to a human being on the phone…. Thanks for the reblog, by the way! How weird! I’ll look into it. Thank you for the alert.